I have a special guest for you to meet today. Debra Janin of Flying Needle Gallery is with us to talk about her wonderful line of handmade products, which are available on her website and now on 1000 Markets as well. Thanks to Debra for her time! Q: Tell me a bit about your business, Flying Needle Gallery. A: I’ve been sewing & designing things since I was old enough to thread a needle….color and texture have always fascinated & inspired me. FlyingNeedleGallery is a collection of accessories – I’ve always felt that accessories are the finishing touches that help you stand out from the crowd. After a career in publishing that literally took me around the world, I knew it was time to apply some of the themes that had influenced me over time – and I turned back to design to express this. A: I launched my velvet scarves in 2002, and expanded to napkins and handkerchiefs the following year. The growth in sustainable products has been amazing over the last few years. And this is increasingly where my focus is. Q: You offer a great selection of napkins and handkerchiefs. I know that it can be difficult convincing people that paper & plastic alternatives really are convenient once you get used to them. We've switched to cloth baggies rather than the traditional sandwich bags and I spoke on the blog last year about using eco-friendly feminine care products. I think people think being greener is harder. What would you say? A: I say it’s easy being green! Kermit may not have fully known what he was saying. Personally, I also think its more fun – I get a real kick out of picking what handkerchief to use, or what napkins I’m going to set my table with. Like anything that might be a change in behavior – it’s a new habit to form – but a good one. And it becomes second nature quickly. I remember having to think about recycling when it first became ‘law’ – knowing it was a good thing, but still grumbling a bit – but it didn’t take long before it was habit, and it felt good to be doing the right thing. Q. 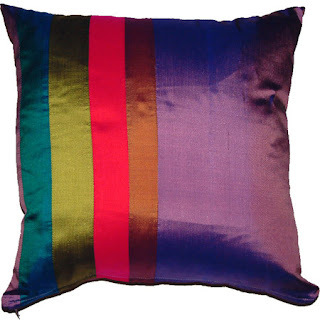 You have such a vast selection of products--from pillows to scarves to custom quilts. Do you have one favorite product that you make? A: My inner child loves my Red Monkey Napkins – it’s hard not to smile with these funny monkeys in your face. A: Handmade has always been special to me – growing up, I sewed, and my mom knitted every sweater we wore. In the larger scheme of things, I see handmade as an expression of individuality – and a way to perpetuate the art of craft. Not least of all, buying handmade gives artisan/entrepreneurs an outreach – or outlet - for their skills, and is economically sound. Do you want my happy tirade about how this country was founded by entrepreneurs? I believe buying handmade is a vital part of existence.